Most individuals that become involved in fishing on the recreational level soon become very enthused with it. It helps them to escape from the responsibilities of life for a little while and just relax. There are some indicators now where some experts believe that the sport of fishing can actually offer some excellent health benefits. For anyone that has caught a fish even if it is small in nature they know the fight that the fish has put up. This puts a demand on the fishermen or woman to tire the fish out and land it. This can demand a lot of stamina and it is actually a good form of exercise for the body. 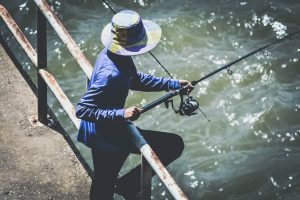 Many think that just standing on shore or sitting in a boat is being in a pretty relaxed state which it is, but indications are that depending on what fishing you are doing you can actually be burning about 200 calories an hour. This may be more so when it comes to shore fishing as you are constantly on the go moving from one spot to another. If the fish are biting then you are certainly being active at reeling them in and landing them. Most times when out fishing it is on a sunny day and this is allowing you to be exposed to the sun which can help to boost your vitamin D.
As long as your enjoying your fishing time it can be a great stress reliever. It is a time to just unwind and enjoy the challenges. That is of course that you can accept that some days you just won’t be landing the catch of the day simply because the fish aren’t biting.